What Life Will You Extend? Let's Sous Vide! Henkelman Jumbo Plus – 18 Years! I just had to drop a quick post about a Henkelman customer in Miami. These guys have a Jumbo Plus vacuum packer at their Spanish tapas restaurant where they serve the most delicious Jamón Ibérico de Bellota. This is a slow dry-cured ham from Spain that comes from black-footed pigs who fatten themselves on acorns (bellota). 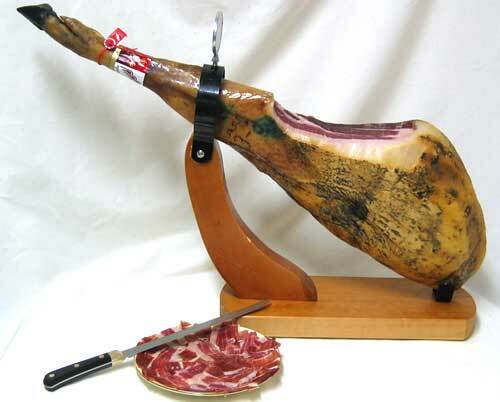 It is easy to compare it to Jamón Serrano or Prosciutto di Parma, however, genuine Jamon Iberico has no real equal. The artisans that hand slice the jamón straight off the bone-in leg, take their craft very seriously. They will slice from different parts of the leg to highlight the different textures and flavors of meat and fat running through this veritable mine of pleasure. Then gently place it in a circular pattern on the plate. Or, if you would like to take some home they can place it in a vacuum bag, pack it in the 18-year old Jumbo Plus and send you off, giddy with your prize. I know…I kind of speak about this stuff as I would a lover, but after the times I spent in Madrid, it has become something I cannot get enough of. Ok, back to the point at hand, these guys have been using a Jumbo Plus Henkelman vacuum packer that they purchased in 1995. That is 18 years of faithful service!